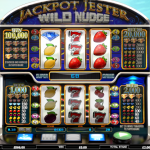 Jackpot Jester Wild Nudge is a sequel of an already existing game, again coming from Nextgen Gaming. 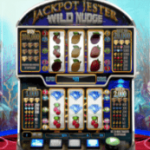 The design of the game is very similar where we have an old style Las Vegas slot machine, but this time the action takes place in what seems like an aquarium. Again, we have all the traditional symbols the familiar fruits, diamonds, sevens, just to name some. There is only one special symbol in Jackpot Jester Wild Nudge that we want to see more often on the reels, the wild. These symbols will substitute for every other symbol to complete a winning line. There are no special features in this game except for the different way this game is played. We have the Super Game here and the only condition you must fulfill is to play with minimum 20 coins. Namely, every time you land a win in the base game all those wins will be transferred to the upper game. Once you land a win you can do 3 things as follows: You can collect the money, you can keep the money in the Super Game bank and continue playing or you can start the Super Game. The only thing that is different here is that the wild appears stacked in the Super Game and if only one part appears it will nudge up or down to cover the whole reel. 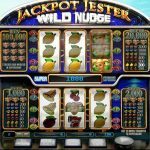 Jackpot Jester Wild Nudge is definitely one of those games that you have to play. Nextgen Gaming tried to create something that will suit those players who are nostalgic for the old style games. And they really did a great job by coming up with this game which is just a posh version of the original game, and you have to experience it for yourself. For another great engaging game you should consider playing Jackpot Jester 50K a 3 reel slot by NextGen.